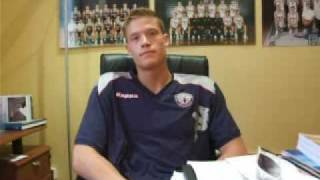 Coming off back to back double-doubles (two identical 16 point, 10 rebound outings) in the extremely competitive Italian first division, this seems like as good a time as any to chart the progress of promising Swedish small forward prospect Jonas Jerebko. Last year was an up and down affair for Jerebko, playing his first season outside of the Swedish league, but weve seen considerable improvement in 08-09 with Angelico Biella. Jerebkos body is looking better and better, as its clear that the work hes put in with Biellas physical trainers is reaping huge benefits. Hes gained almost 30 pounds since arriving in Italy, up from a scrawny 191 pounds to a much healthier 220which is a big deal in such a physical league like the Italian A1. He continues to play the small forward position almost exclusively despite standing 6-9, and looks far more confident, focused and intense than he did when we first saw him just over a year ago. Few teams in European basketball would have the patience or foresight to allow Jerebko the opportunity to play through his mistakes the way the coaching staff at Biella has (in a starting role no less) from the moment he arrived, and its starting to reap huge dividends for themnot all that unlike what this same team went through developing Thabo Sefolosha a few years back. Jerebko is a pure role-player in the Italian league, a niche that he thrives in considering his versatility. He does a little bit of everything for Biella, be it running the floor in their extremely up-tempo offense, crashing the offensive glass, rotating defensively, or doing a terrific job in the passing lanes. Jerebkos combination of size, length, athleticism and activity level really stands out in this setting, and with the increased toughness hes showing, hes been able to make a big difference on both ends of the floor. Defensively is where Jerebko is probably at his best at the moment. Looking very comfortable guarding perimeter players, and having a huge size advantage over anyone he matches up with, Jerebko has the length and lateral quickness to contest almost every shot. He is extremely competitive on top of that, doing a terrific job switching on screens and being extremely difficult to shoot over, as hes very fundamentally sound. He comes up with a fair share of steals and blocks, and is a very good rebounder for his position. This type of hybrid-forwardcapable of playing the 3 on a half-court team, or the 4 in a more up-tempo system, is very much en-vogue these days, especially when they can defend both positions. As his frame continues to fill out, he will only become a better defender. Offensively, Jerebko is somewhat limited, but clearly seems to be making strides. Hes an extremely efficient playershooting 64% on 2-pointers, and 42% on 3s, even if he only averages 9 points per game (in 25 minutes). Jerebkos jump-shot looks very good with his feet set, and recently hes even showing an ability to come off screens and make shots as wellwhich is very intriguing at his size. Hes a limited ball-handler, being somewhat predictable with his drives, and therefore has only gotten to the free throw line 7 times all season long in 16 games. His very nice athleticism makes him an explosive finisher around the basket, thoughhes come up with a number of highlight reel caliber dunks already this season. Jerebko has a good feel for the game and is nowhere near a finished product at this point, still capable of adding plenty of polish as well as continuing to get stronger. Having left Sweden a little bit later than he probably should have, hes still learning the nuances of high-level basketball, but has proven to be an extremely quick study. Considering his physical tools and the fact that hes a late-bloomer, Jerebkos upside is significantly higher than the typical 1987-born European player. NBA teams could very well take a liking to him due to his athleticism and defensive potential, which are not all that typical on this side of the ocean. His American background and comfortable buyout situation (he has just one more year on his contract with Biella after this season) are also big pluses, making it very easy to see him getting drafted somewhere in the second round, possibly very early on. Hell need to become a reliable outside shooter from the NBA 3-point line and show that he can continue defend his position in order to develop into a legit NBA rotation player, but thats beginning to look more and more like a legit possibility. The Swedish forward ended up having a very nice camp here, showing more offensive versatility and all-around potential than we were able to see at times in Biella this season. Hes added a great deal of weight to his excellent frame, completing a pretty intriguing physical package at the small forward position if his perimeter game continues to progress, as he is a very good athlete with great size for a 3. Skill-wise, Jerebko looked comfortable putting the ball on the floor and attacking the rim at this camp, showing plenty of confidence and aggressiveness getting to the basket, and even some nice moves adjusting his body to avoid oncoming defenders in mid-flight. He showed a lot of toughness holding his ground inside the paint when bigger players tried to post him up, and displayed decent lateral quickness staying in front of wing players on the perimeter. Hes a fairly tough guy who doesnt seem afraid to mix things up. Jerebkos long-range jumper remains the final piece to the puzzle needed to make the transition to being a full-time perimeter player. His release is fairly slow and even though he can hit shots from behind the arc, its too streaky to count on consistently at this point. Regardless, he showed more tools than most of the players at this camp, particularly when long-term potential is taken into consideration, and is someone that teams will look at closely next season in the Italian league to decide if hes draft-worthy.